Trips to the dump could be a changed experience in the future; refuse district contemplates expansion for its central facility in Edgartown. Trips to the dump may become a changed experience for Island residents if funding for an expanded Martha’s Vineyard Refuse District is approved at town meetings this fall and next spring. 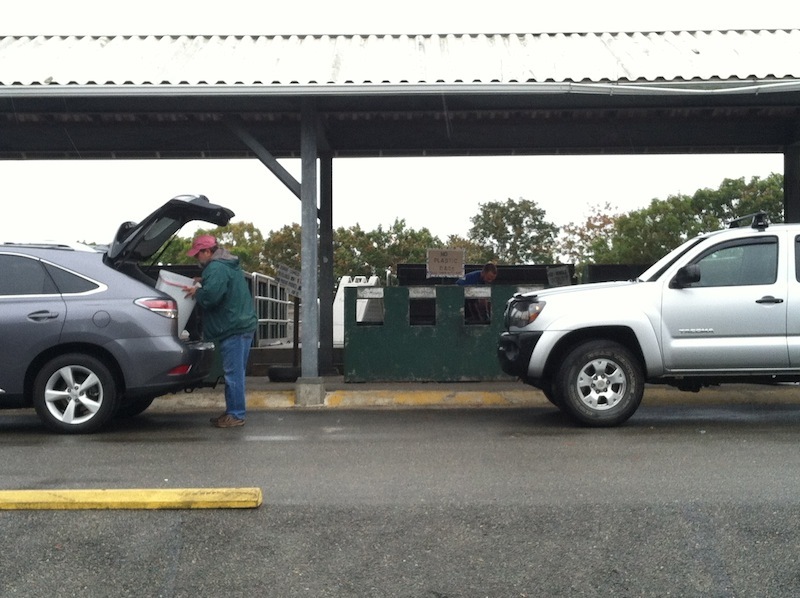 The traffic flow at the Edgartown transfer station, which handles waste from Edgartown, Aquinnah, Chilmark and West Tisbury, is often congested, especially in the summer, when huge volumes of trash pass through the station every day. The station handles both residential and commercial waste. A $2.5 million expansion plan now in the works would create a separate drop-off facility for residential trash, including areas for containers and recycling, along with a new road for residential traffic and a second garbage scale for pickup trucks and commercial use. The expansion would increase vehicle capacity from about 500 to 2,500 per day. District manager Don Hatch has already visited three of the four member towns this fall to seek backing for a town meeting warrant article that asks for up to $2.5 million to restructure the district. All four towns will need to approve the spending in order for the project to go forward. Oak Bluffs and Tisbury share a separate transfer station, which is operated by Bruno’s Rolloff and overseen by local boards of health. Both districts ship their trash off-Island. According to the most recent budget for the expansion project, the greatest expenses would be for concrete structures and 158,300 square feet of new pavement. Paving is by far the biggest expense in the budget and would cost about $1.1 million. The district anticipates the cost of concrete and asphalt to rise by three per cent each year for the next three years. Mr. Hatch believes the project will fall within budget, as long as it is completed by 2016. The Vineyard produces large volumes of waste, none of it treated on the Island. The refuse district processes and ships more than 11,000 tons of waste and construction material annually, according to its website. The majority of this material (more than 9,000 tons) goes to the SEMASS incineration facility in Rochester. Recycled construction materials go to Taunton. Recycling efforts remove more than 1,200 tons of mixed materials, 483 tons of cardboard and paper, 200 tons of metal, 300 tons of batteries, 16 tons of tires and 500 tons of leaves and brush from the waste stream annually, the district reported. Beginning this week, the composting of food waste became mandatory for businesses and restaurants in the state. In two or three years, Mr. Hatch said, it will likely be required of residents as well. He said a state solid waste master plan aims for more separation of municipal garbage for reuse and recycling. “For us to separate more, we need the area to do that,” Mr. Hatch said. The refuse district hopes to use more of its buildable area, which is limited by a 200-foot buffer zone. The planned new road would follow the perimeter of the developed area. Congestion at the transfer station has been an ongoing problem, with traffic increasing by two or three per cent each year over the past 10 years, Mr. Hatch said. “Whether it’s the [growing] Island population, or people trying to save money and do it themselves, instead of hiring somebody to pick up at their house, I’m not sure what is driving it,” he said. Based on a 1989 assessment of how each town uses the station, Edgartown would pay for 69.5 per cent of the total project, with West Tisbury paying 15.5 per cent, Chilmark paying 12 per cent and Aquinnah paying three per cent. Mr. Hatch said the ongoing sale of stickers for district access confirm the percentages. Three of the four towns have agreed to bring the issue to a town meeting vote. In response to concerns raised by the selectmen in Chilmark, the district revised the budget to include a reduced contingency fund and the second garbage scale. (The second scale was originally part of phase two and is estimated to cost $144,000.) Mr. Hatch has not yet approached the Edgartown selectmen. “I have a feeling that the towns are for this and they want to see this grow for the future,” he said. Chilmark and Aquinnah will each hold a special town meeting in October. Special town meetings have not been scheduled so far for the off-season in Edgartown and West Tisbury; if no special town meeting is scheduled the article would come onto the annual town meeting warrants in those towns. The district hopes to begin the project next fall.